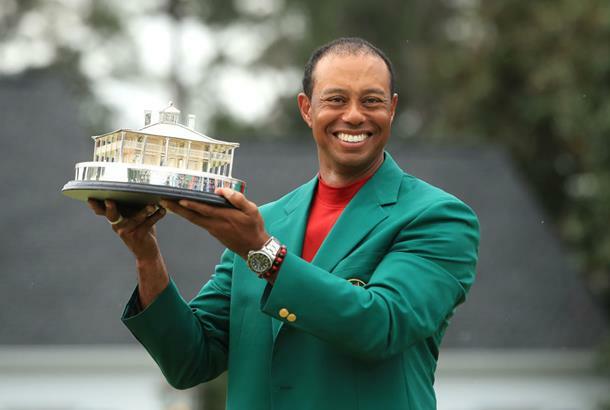 Tiger Woods ended an 11-year wait for his latest major title by outlasting a wide-open field over the final few holes to earn his fifth green jacket - coming from behind in a major to win for the first time. Woods finished with a two-under 70 to beat a field packed full of talent on 13-under-par, and it's not overly surprising many are calling his feat one of the greatest comebacks in sporting history. Battling back from injury and a multitiude of surgeries that left many wondering if he would ever play again, Woods' successful return to the game just over a year ago has proved that it doesn't matter if you've got a fused spine... as long as if you've got the determination to win. For the 43-year-old, the moment was something he, like the rest of us, will never forget. "Just unreal, to be honest with you," Woods said of his victory. "You know, just the whole tournament has meant so much to me over the years. Coming here in '95 for the first time, and being able to play as an amateur; winning in '97, and then come full circle, 22 years later, to be able to do it again, and just the way it all transpired today. "There were so many different scenarios that could have transpired on that back nine. There were so many guys that had a chance to win. Leaderboard was absolutely packed and everyone was playing well. You couldn't have had more drama than we all had out there, and now I know why I'm balding (laughter). This stuff is hard. "Yeah, just to come back here and play as well as I did and did all the things ‑‑ all the little things well this week, and to do it here. This has meant so much to me and my family, this tournament, and to have everyone here, it's something I'll never, ever forget." It was a day to remember at Augusta as groups of three teed off on both the first and tenth holes for the first time, and very quickly Tiger emerged as the key challenger to overnight leader Francesco Molinari. Molinari got the better of Woods in their final round pairing to win The Open and beat him three times at the Ryder Cup in 2018, leaving a sense of deja vu when Tiger found himself two shots behind and in the final grouping on Sunday with the Italian. But the Molinari who had gone 43 holes without a bogey seemed to be a little out of sorts on the final days at the Masters, needing a precise short-game to scramble for pars over the first six holes and taking time to practice a rotation swing drill following his drive in to the trees on the seventh. Woods meanwhile let chances go by as he moved a shot closer with a birdie on the third only to make back to back bogeys as he struggled to find a rhythm with his putter. But as Woods proved on the seventh hole, you don't need to worry about your putter if you can hit your second shot to 2 feet as he moved to within one shot of the lead. Both players made birdie on the par-five eighth, and Tiger headed to the 10th tee just one behind. Yet they say the Masters doesn't start until the back nine on Sunday, and that phrase was never more true than today. Woods bogeyed the 11th hole to gift Molinari a two-shot lead as others like Finau and Koepka remained in the mix, but as the winds began to pick up and the rain began to fall, disaster struck for the leader. With shades of Jordan Spieth's collapse in 2016 Molinari found the water on the 12th hole, and a double-bogey suddenly brought the whole field back in to contention. Patrick Cantlay was the first to break free as he eagled the 15th to move to 12-under-par, and he was soon joined by Xander Schauffele with back to back gains of his own. Woods and Molinari would both rejoin the leaders as both Koepka and DJ also reached the target of -12, but Tiger was the one to make the most of more remaining holes than anyone else. He tapped in for birdie on the 15th to move to -13, while second ball in the water on the same hole left Molinari with another double-bogey and too much to do. But as the rest of the field made mistakes or left their birdie runs too late, Tiger Woods found himself increasing his lead to two after almost holing out on the par-three 16th. By the time he made it to his ball on the 18th fairway, Woods could see three-time major champion Brooks Koepka miss his birdie putt - and he knew he had a two shot cushion. He missed the green with his second shot but a two-putt bogey for a 70 left Tiger at 13-under par and in a very familiar place to him: At the top of a major leaderboard at the close of play. Woods roared and raised his arms up as he celebrated his newest accomplishment, and the chants and cheers from the crowd made it known the approved of their champion.